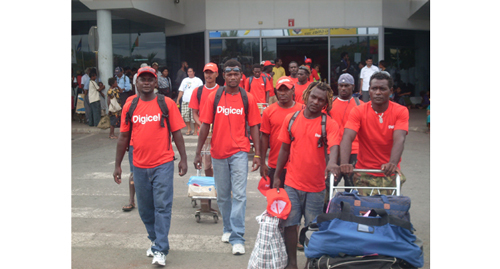 THE majority of Team Bougainville arrived yesterday in a ‘loud’ sea of red, and all geared up for the next nine days. Strong teams from the sports of rugby league nines, rugby sevens, rugby touch and taekwondo arrived in the third group after the earlier arrival of athletics last Saturday while the others arrived on Monday. Basketball and soccer are yet to arrive, along with strong medal hopefuls in volleyball and boxing. With the game schedules and dates yet to be finalised, Team Bougainville is intent on making their mark, even if its respective events later. Former Port Moresby Vipers Joe Gatana, Velarian Hakeria and another legend, dual international James Miviri are at the helm of a very young Bougainville side to the League Nines event with stakes to claim. “Na Mipela ikam win (and we’ve come to win)”, Miviri replied when asked upon arrival. The sevens rugby side that arrived as part of the group, however has gone with the direction to expose a new wave of players at this level, tinted with a couple of seniors from the national sevens side, for a medal chance. Another feature that will probably be a common occurance in other teams is that several members of one code will be required to fill the shortfall in other sports during the games. Players in the league nines will also play rugby sevens for Bougainville due to the numbers as not all teams in the contingent have a full complement.